The Numaish Winter Show is set to take place this coming Saturday 10th December at Murooj Rotana. The exhibition is a great time to check out the latest in Indian fashion and stock up on trendy ethnic and Indo-Western pieces. The exhibition hosts a long list of well-known Indian fashion designers, and one paticular designer I am especially keen on meeting (and hopefully shopping with!) is Purvi Doshi. Her self-named label has already created waves in the Indian fashion industry. Her pieces are traditional yet timeless, and the sole premise of her brand is sustainability, and being kind to the eco-system. I had a wee chat with Purvi. Read on to know more about her latest collection, her stance on Indian fashion and tips on how to stay ethnically and ethically chic! The tradition of wearing a Bindi, the ceremonial red dot worn by women of the Indian subcontinent, originates from ancient Hindu beliefs. The word ‘Bindi’ is derived from the Sanskrit ‘Bindu‘, or ‘point’. In Hinduism, this point on the forehead (right between the eyebrows), is considered the sacred spot from where creation begins. Traditionally, round red bindis were worn by married women to signify their marital status. Over time, the humble bindi has surpassed religious significances, and has gone on to become a besotted ethnic accessory that comes in many colours and shapes. 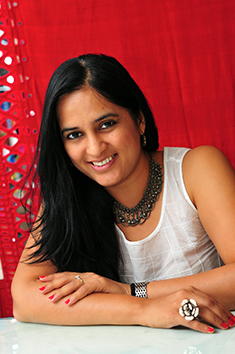 I recently got introduced to the very talented Ninorah Fernandes, founder and creator of Nindi. A clever brand name that incorporates the bindi with her very own name, the Nindi range takes inspiration from all across the globe and best of all, they can be reused time and time again. They even have Hamsa Nindis! Ninorah gives us more insight into her innovative brand, read on for more! When visiting my husband’s hometown of Shillong, the very picturesque hill-station capital of Meghalaya (India), we always look forward to visiting our very talented aunt, Mrs. Nurara Hazarika. Fondly known as Bulbuli Aunty, her talents in the kitchen have turned her love for cooking and baking into a very profitable business. Bulbuli Aunty’s dinner parties are always an elaborate feast, with a delicious array of dishes from all corners of the globe. Over the years, she has a steady flow of novice cooks, signing up for her cooking classes and these have now expanded beyond the borders of Shillong. Today, she has very generously shared a special cake recipe with us. Simple as it looks stunning, Bulbuli Aunty’s Chocolate Velvet Cream Recipe is sure to impress even the most cynical of dinner guests! Are you ready for the Numaish Festive Show tomorrow?! I for one have a very lengthy wishlist at hand, and am super excited about visiting the stalls of prominent and upcoming fashion designers from India. Absolutely love Indian fashion, especially Indo-Western silhouettes! Today I’m introducing you to Pratik and Priyanka, the duo behind the funky label I am Design. And yes, they are going to be selling their wares at the Numaish Festive Show this Friday and Saturday at Hotel Conrad Dubai! Just three more sleeps before the Numaish Festive Fair! Scheduled to take place this coming Friday 23rd September till the late hours of Saturday 24th at Hotel Conrad (Dubai), the fair is a must-visit for shopaholics who are on the lookout for something uniquely different. One prominent designer who will be showcasing her wares at the fair is Anita Kanwal. Best known for her endless list of Bollywood appearances and also a major hit on the Indian television screen, Anita has always been known for her immaculate sense of dressing. It is therefore only natural she ventured into the world of fashion. I had a little chitchat with her on the eve of the Numaish Festive Fair. Got the Sunday morning blues? Fret not, you have the Numaish Festive Fair to look forward to this coming weekend! From Friday 23rd to Saturday 24th September, the Numaish Festive Fair will showcase an array of on-trend designers at Hotel Conrad, Dubai. One prominent label on the list is Surendri. Designer Yogesh Chaudhary already has an ardent fan following in India and online, and his is a collection you don’t want to miss.